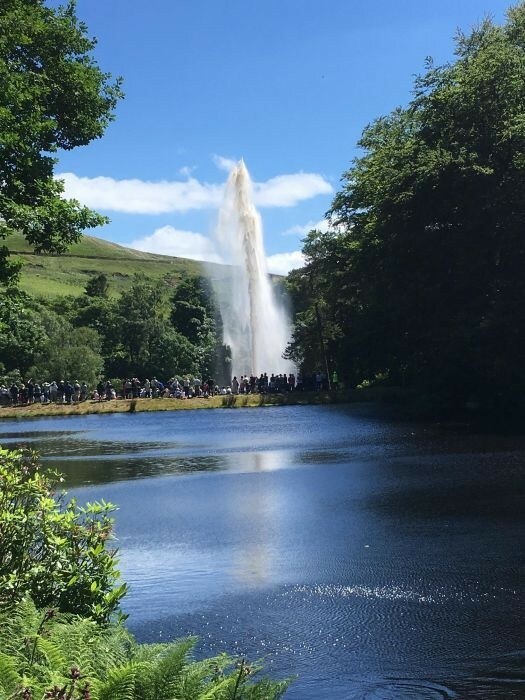 Please note that this walk on Sunday 8 July, 12:00pm is a strictly a ticket-only event. Tickets cost £5 each and can be purchased from the Crossroad Inn, the Cat ith Well Inn, Woodlesford Newsagents near Mount Tabor and Harvey’s of Halifax ( 3rd Floor Customer Services). For families, a ticket enabling entry for two adults and up to three children is £15. Children under 5 have free entry. You can also book tickets online via Eventbrite. This famous local landmark designed and built in the 1870’s comprises an ornamental water garden situated between two reservoirs. The garden consists of a main circular pool in the middle of which sits a single jet fountain. It attains a height that is only second in England, to that at Chatsworth House! A picturesque walk, 2.5 miles each way will commence from the Cat I’th Well Inn at 12:00pm prompt. The estate will be open from noon until 3:00pm. Suitable footwear should be worn as parts of the walk are wet and muddy and uneven and last year a number of walkers finished up with wet feet! Well behaved dogs are welcome, but must be kept on a lead. Watch a great video of the 2017 fountain walk, by Alan Hamer, with music by Analog Heart.